We create content on your site to help your customers find exactly what they are looking for. Your potential customers will never have to leave the website to LEARN MORE about the product or service you’re offering. Keep them on your website by providing them with the resources they need to make an educated purchase. We capture the essence of any business by developing brand recognition, a steady flow of new leads and consistent website traffic, giving you the advantage over your competitors. Other companies offer SEO services with keywords and other tactics that may get you to the top of Google, but what good is that if your website doesn’t have the information, resources, and reviews of what the consumer is looking to find on your website? Our Website Management services include a wide range of content that has built in SEO by creating information that helps your website become a one stop shop for anyone looking for what you are selling. We tailor your website specifically for what you are specializing in. Many business’ websites capture customers’ attention, but customers quickly have to leave the website to go “Learn More” about the product from another website, leaving your website behind. Do you really want your website visitors going to a different site that can potentially affect your gross sales? Stand out from the competition! Stop competing with other businesses selling the same products, when you had them on your website first! Stop leaving money on the table for your competitors. 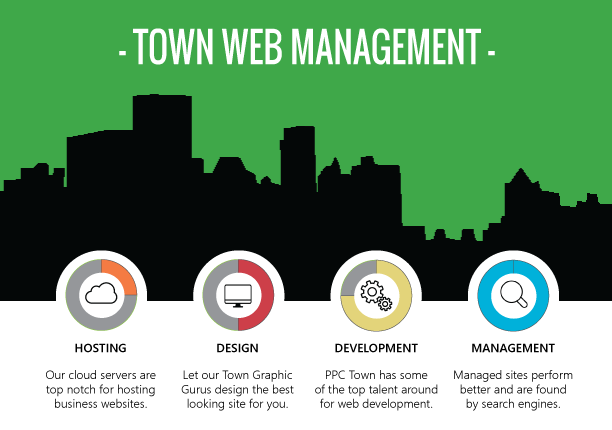 PPC Town will make your website a lead generating machine. Your website leads are exclusive and generate the most profit. Put into effect an ongoing marketing strategy involving PPC that will increase your website presence and prevent any need to give out any free services or products! That directly affects your bottom line! When you buy a lead from a 3rd party source, the customer is getting offers from everyone! Best price wins. Stop losing money selling your services or products!